Remember Ronnie from our Leeds centre, the loveable pup with megaoesophagus? Well, we have an update for you! 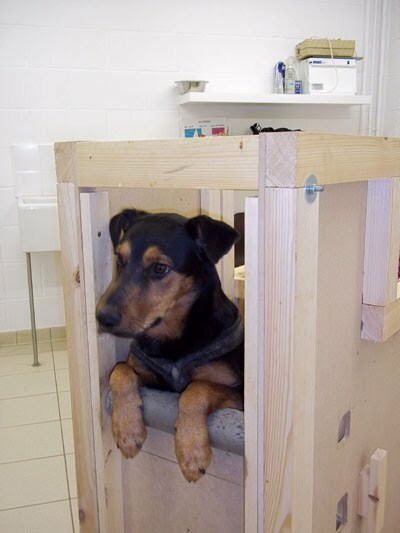 Ronnie the 8 month old cross breed is still looking for his forever home, but he now has a stylish new feeding station specially designed and built for him by the dedicated Leeds team. Megaoesophagus is a condition that means he can’t swallow; Ronnie has to eat standing on his hind legs allowing gravity to take food and water – which is made into a jelly so he can digest it – into his stomach. Ronnie needs to eat three times a day and each meal lasts 20 minutes because staff feed him slowly from a spoon to ensure it all settles, so having the special feeding station has made the process much easier. If he were left to eat and drink in a normal way from a bowl on the floor, he would be sick and could eventually starve. Ronnie is healthy in every other way and is a lovely, playful pup but because of his feeding requirements, will need to be the only dog in the home. He also needs an active family and would be more suitable with older children. Due to his condition, Ronnie will be a part of our foster scheme and his new owners will receive financial support for any veterinary treatment required throughout his life. If you are interested in rehoming Ronnie, please contact our Leeds centre on 0113 281 4920. Ronnie also currently features on our media centre and you can read more about him here. OMG bless him so so so much, I wish I had the time....... Hopefully someone has. I have a dog (fudge, working cocker spaniel) who is allergic to food, which can be quite a challenge, but don't let difficulties put you off in anyway, it just makes the bond with your k9 stronger. He is gorgeous! Come on someone in the Leeds area with time to give this adorable pup the love and care he needs. BECAUSE HE'S WORTH IT! He is a loverly dog with a lot of love to give. I have watched him grow over the last few months and although I am only in a couple of days a week, he remembers who I am and is happy to see me. I would love to see him go into a forever home. Presumably, once he is fully grown, he can go to two meals per day. maybe be worth mentioning on his posting. E.
Really great to see him getting such a great start despite his problems!! I hope he finds a family soon! !